In past generations, one day a week was set aside as "laundry day." With our busy lifestyles, we can't imagine spending all day washing and ironing. But that doesn't mean we don't want to look sharp. This cordless iron has a double-tip design to get the job done fast. It gives our clothes the crisp look we love, so we don't have to sacrifice all the standards of bygone days. Stainless-steel soleplate with curved, elliptical shape for smooth, effortless gliding. 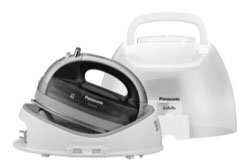 Ironing no longer has to be considered a tiresome chore thanks to this uniquely designed handheld iron by Panasonic. Equipped with 1500 watts of power, the sleek-looking unit delivers an array of advanced features for safety and exceptional convenience, making it easy to move quickly and efficiently through piles of dress shirts, slacks, and napkins, even large items like tablecloths and curtains. Thoughtfully designed with cord reel on the power base and a cover case with carrying handle. 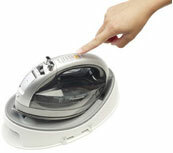 Quickly get to those tight spots like collars and cuffs without rotating the iron or yourself. Unlike conventional corded irons, the multi-directional, cordless 360° Freestyle iron's innovative design makes it possible to iron in any direction with precision, ease, and speed. With its stainless, curved bottom and sleek, ergonomic design, the iron glides smoothly and effortlessly--naturally move in any direction without bunching or wrinkling the fabric. Move in any direction without bunching or wrinkling the fabric. 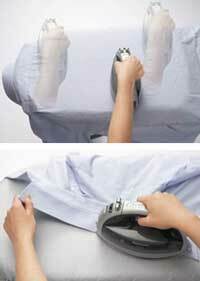 Our cordless steam iron helps take the hassle out of ironing. 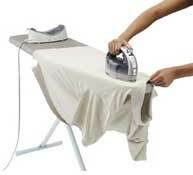 There is no cord to get tangled or caught on the end of the ironing board, so ironing is quick and easy. Freedom of movement--no power cord getting in the way. Anti-Drip System provides a water seal inside the iron to protect fabrics from water spotting. Set the temperature with a touch. Iron's innovative design promotes precision, ease, and speed. The spay mist button helps eliminate stubborn wrinkles by directing extra moisture where necessary. With the push of a button, the vertical steam feature allows you to direct a burst of steam to hanging garments. Steam generates from all the steam holes for fast results. Equipped with an electronic sensor, the iron will automatically shut itself off after it has been left on the charging base for more than 10 minutes. Set the charging base onto the ironing board. Pull the AC power cord from the cord reel on the base and plug into an outlet. With the AC power cord on the base there's no cord on the iron to get in your way. Fill the detachable water tank with water. Set the temperature with the "set" button. Put the iron back on the charging base every time you rearrange the garment on your ironing board to keep the iron hot. Awarded the Good Housekeeping Seal of Approval, the innovative 360° Freestyle iron measures approximately 11-1/5 by 6-8/9 by 8-2/7 inches and carries a one-year limited warranty.